If former President Barack Obama can invent the Austrian language, then Sen. Cory Booker can invent the Swiss one. Mr. Booker’s awkward exchange on the campaign trail with a radio reporter in Cedar Rapids, Iowa, was transcribed and posted on Twitter by CNN executive producer David Galles. Mr. Booker first mangled Spanish grammar when asking the reporter “Tu hablo espanol, Si?” When the reporter replied “No, Swiss radio,” the senator and 2020 Democratic presidential hopeful fumbled his facts about the world even further in an effort to claim unsophistication in a sophisticated-sounding way. QUESTION: Senator this is your first day really on trail, what is your first impression? Booker: Tu hablo espanol, Si? Booker: Swiss! Yeah, I do not speak Swiss. (Laugh) I cannot even say swiss cheese in swiss. “Swiss! Yeah, I do not speak Swiss. (Laugh) I cannot even say ‘Swiss cheese’ in Swiss,” Mr. Booker said, according to Mr. Galles’s transcription. Switzerland has four national languages — German, French, Italian and Romansh, the first being the most widely spoken. Like with the varieties of English, there are dialect differences between the first three and the languages spoken in the nation of origin — especially with German. Both Swiss Standard German and colloquial Swiss German dialects can be difficult for people in Germany to understand. There is precedent for American politicians making up languages in conversations with European media. Mr. Obama, at a 2009 press conference in France, told an Austrian TV reporter about “wheeling and dealing” in the U.S. Senate: “I don’t know what the term is in Austrian.” There is no such named language as “Austrian” either. Like the majority of their Swiss neighbors to the west, Austrians speak German and it’s their sole official language. © Copyright (c) 2019 News World Communications, Inc.
Oh, but they do speak Swiss. The left that is. Their “logic” is so full of holes. Just like the cheese, it’s made of hole milk. To me, it is not that big of a deal, but I can only imagine the “controversy” that would have been created had a Republican candidate been presumed to assume that the reporter was Hispanic. They’d be bashed for weeks..
You KNOW, of course, that if EITHER of those mistakes had been made by President Trump (or worse, George W. Bush) – The Left would have had a non-stop meme-fest on how STUPID (fill in the blank of Republican) is! They already have a non-stop BASH trump fest on all late night ‘comedy shows’.. Someone put an apple on his head, and a blindfold on William Tell. Booker didn’t pull his worn out race card again? Must be losing its luster. No big deal, the Dems created a whole new “race”, Hispanics, and nobody noticed! I know right? It drives me mad…latin, latino, latina, hispanic…everyone is nonsensical. And for God’s sake, don’t ever call a Spaniard any of those fake races. They themselves say they are white Europeans. There are actually only three races: caucasian, asian, and negroid. Everything else es una mezcla. If he was, he came out brain first then. because if liberals have one, that’s where its located! Obama and Booker are men of the world trying to speak Austrian or Swiss. Hey, Al Gore invented the internet. Are all Dems this dumb? If so, how do they get college educations? They’re basically wastes of time and money. YES. All dems are this dumb! This coming from a guy who said he drove to Hawaii from New Jersey. I think the American people need some one smarter than Booker. Come on guys. Cory Booker has many faults, but I don’t think it’s productive to mock him because he made a faux pas with regard to Swiss language. It’s not a mistake limited to Democrats or Liberals. We waste our time in mockery. Stick to substantive issues. He has enough of those we can oppose. We all make such mistakes. The problem is they think they are so much smarter than everyone else and therefore should tell us how to live our lives. I don’t want someone that stupid telling me nothin’. You know, like the congressman from Georgia who thought Guam might tip over if the military sent 2500 more families there. Or like Biden who asked the military vet to stand before he noticed he was in wheelchair. Or like Obama who said corpse men when referring to military corpsmen, pronounced as kore men. But yes, old Hank Johnson was most hilarious Dem fool in Congress when in committee hearing he wanted reassurance that Guam wouldn’t tip over if few hundred more military were sent there. I occasionally go to you tube to view that clip of him just for laughs. Hey, if Al Gore can invent the Internet, and Hillary was passed over as an astronaut because of gender (never mind she can’t handle emails), and AOC can invent new economic theory, and Nancy Pelosi can invent her own bible verses, Hey, whatever floats their boats! The rest of us are not having any of their lunacy! 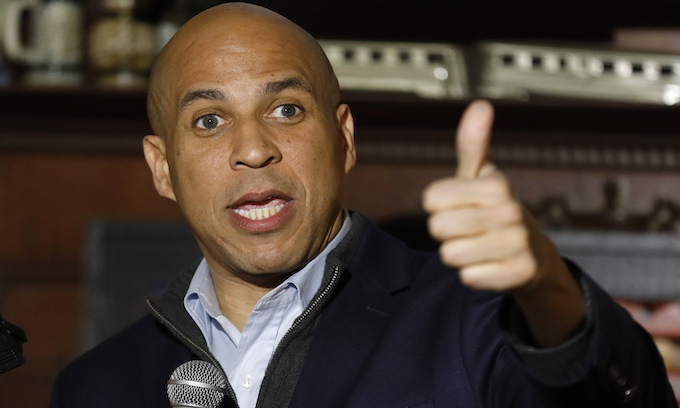 Booker & AOC are the future of the Democratic party……….Hard to say that with a straight face & I thought Hillary had the moron of the century award but these two are setting new standards for the Democrats. Switzerland is my paternal ancestral home, and has three official languages: German, French and Italian. Most Swiss speak at least two of the three, usually German and French, as well as English in the urban centers. As the old saying goes……………STUPID is as STUPID does! All Hail spartacus! Cory can’t be concerned with facts because like Kermit O-C, his heart is in the right place, so he knows he is really correct. He endorses the “New Green Deal” and opposes cow farts. . .he should have called himself “Farticus”. . .